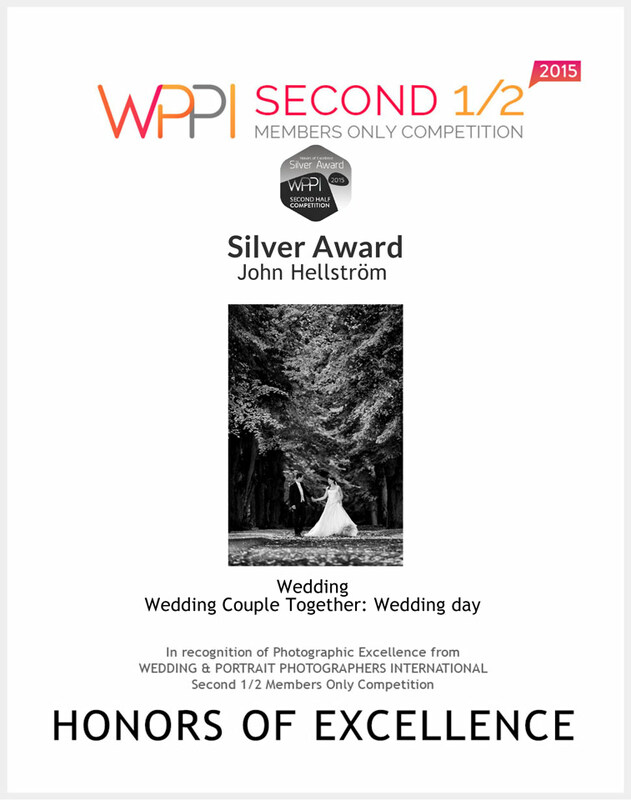 The Swedish wedding photographer John Hellstrom from Stockholm wins three awards "Honor of Excellence" in the international competition for portrait and wedding photographers, WPPI (Wedding and Portrait Photographers International) 2nd 2015 in New York, for his wedding photographs. During this autumn, John Hellström was also "Highly Commended" for three photographs in the SWPP (Society of Wedding and Portrait Photographers) contest in London. In January 2016, there're will be the annual "Print Competition" in London for SWPP and in March in Las Vegas for the WPPI. The experiences from 2015 will help to refine the coming entries, so that Sweden can be more competetive internationally in wedding photography. WPPI is one of the largest organisations for portrait and wedding photographers. WPPI describes themselves as "Wedding & Portrait Photographers International (WPPI) was founded in 1978 to serve the needs of wedding photographers, then known as the “weekend warriors??? – an often neglected segment of the industry. Since our first convention and trade show in 1980, we have grown into one of the largest events in the trade. WPPI 2014 drew over 12,000 attendees and 350 exhibitors and embrace photographers from all genres, including portraiture, fine art, photojournalism, commercial, video, and advertising. The larges European organisation for prpfessional portrait and wedding photographers is probably SWPP, who writes the following on there webpage: "Established in 1988 under the Chairmanship of Derek Avery, the Society of Wedding and Portrait Photographers was founded to service the needs of professional wedding and portrait photographers, whether in full or part-time occupations.